So, as most great ideas start, the origin of the Work4It® app started over a beer (or a few) on a Friday afternoon after work. That’s when Torp told me (Dave) of his idea for an app that could track your workouts and tell you how many beers you’ve earned. He said that in all of the years that he ran preparing for the annual PT test (we are both retired military) or just working out in general he always did it in terms of how many beers he earned. Being a fan of beer as well, I loved the idea and suggested that we pursue it. Shortly thereafter Sweat Equity, LLC and the Work4It® app was born and we started our 2-year venture to create a rewards-based app that motivates users to earn the kind of rewards they really want, rather than exercising simply for a number of calories or miles. During the development phase we came to the conclusion, however mind-boggling it may have been to us, that not everyone is as motivated by beer, like we are. So, we decided to add a few more rewards (pizza, wine, and chocolate) for users to choose from. We hope you enjoy the Work4It® app and that it helps motivate you to keep moving and earning guilt free rewards. The Work4It® app is a fun, rewards-based application intended to not only motivate you to exercise, but to provide that extra little push that everyone needs to keep going. 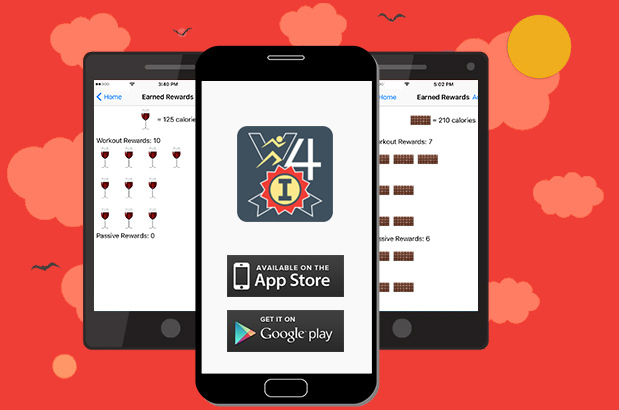 The overall premise of the Work4It® app is that while you are exercising the app “builds” items that you have earned based on your preference of rewards and your overall activity. For example, you select your preferred indulgence (i.e. pizza, beer, wine, chocolate) and the app presents a visual representation of a pizza pie being built by the slice or a beer glass filling up, and so on, based on your movement. The idea being that, rather than working out for a number of miles or calories you can motivate yourself to earn that extra slice of pizza or beverage of your choice and hopefully give yourself that extra bit of motivation to keep moving. Rather than creating your own milestones during your outdoor workout; be it running for three more songs, walking a couple extra blocks, or biking a few extra miles; or during your indoor exercise routine on the treadmill, elliptical, stationary bike, stair climber, and so on, Work4It® equates your activity into rewards by simply having your smartphone on you during your workout. Whether you carry your phone in your hand, in an armband, or in your pocket, Work4It® syncs with the technology already on your phone to track your activity and build your selected reward so that you can see your progress and then treat yourself knowing that you’ve earned it. From the avid marathon runner to the person that dreads the morning alarm for the trip to the treadmill in the basement; whether you’re an avid cyclist or enjoy the occasional bike ride; regardless of your method or level of fitness activity Work4It® provides a fun way to motivate you to get moving and stay moving. Work4It® is not intended to be a weight loss app and makes no claim to that effect. Our app is also not going to be a precision calorie tracking tool, as is the case with most fitness tracking devices, so there may be some variance in the overall calorie count/rewards earned when compared to other tracking devices (who trusts what the treadmill says anyways). 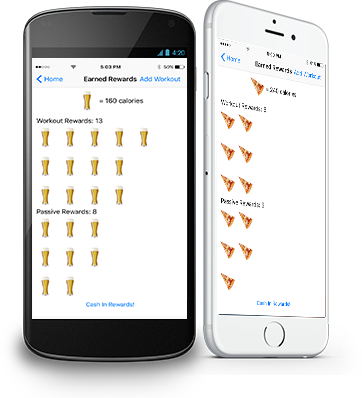 What we do claim is that the Work4It® app provides a novel and fun way to track your workouts and hopefully motivates you to earn the kind of rewards that you really want. The basic idea behind the Work4It® app is that we all need some form of motivation to get us working out and to push us to achieve measurable results. While 6 pack abs are not in the cards for most of us regardless of how many miles you put on the treadmill, you can earn your 6 pack in another way. The Work4It® app helps motivate you to exercise and keep moving by translating your motion into rewards that you earn and enjoy guilt free. Because after all, you can have your pizza/beer/wine/chocolate… and you can eat/drink it too… but you gottaWork4It®. When you open the Work4It® app for the first time you will be provided with the obligatory disclaimer because after all, the last thing that we want is for anyone to be misled or worse yet suffer ill effect or injury due to reward consumption. After you acknowledge the legal stuff you will be asked to enter some personal data. The app takes the data you enter into account when calculating the rewards you earn so entering this information will enable a more accurate and personalized experience. Rest assured that we have no interest in any of your data and nothing you enter will go beyond your phone, but you can still use Work4It® even if you don’t enter your specific information. Your next step is to select the reward you want to work for. After choosing from the options of pizza, beer, wine, or chocolate you are ready to go. There is nothing extremely scientific about how the Work4It® app works (except for all the extremely scientific stuff inside your phone that makes it work). All you have to do is have your phone on you while you work out and you’ll be earning your rewards as you go. Work4It® will track the rewards you earn while you are moving throughout the day or you can select the Start Workout mode to specifically track the rewards earned during your workout. When you’re done, touch the Stop Workout button and Work4It® tells you how many rewards you earned. You can also tap the primary reward screen to see the cumulative Workout Rewards and just walking around or Passive Rewards you’ve earned. You can also use the Add Workout option for those times that you don’t have your phone on you during your workout. Then, when you’re ready to reap your rewards, tap the images on the cumulative screen and select Cash In Rewards.